Mumbai, March 23: Today is the birth anniversary of the great Maratha warrior king Chhatrapati Shivaji Maharaj- as per Tithi, which means according to the Marathi calender. Every year, there are two celebrations of the birth anniversary of the Maratha king. The government celebrates the anniversary on February 19, while many locals and experts of the Marathi culture celebrate it according to the tithi of Falgun Vadya Tritiya (third day of the month of Falgun which falls between February and March). Shivaji Jayanti 2019: Sachin Tendulkar Greets Nation on Chhatrapati Shivaji Maharaj's Birth Anniversary. Earlier, there was a dispute about Shivaji Maharaj’s birthday, which was considered to be April 7, 1627, and Vaishakh Shuddha Dwitiya as per the tithi. 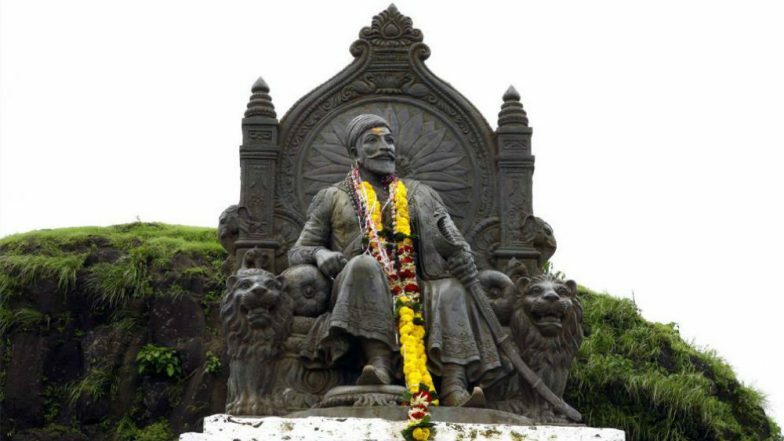 Shivaji Jayanti 2019 Wishes: Best Shiv Jayanti WhatsApp Stickers, Status, Messages, GIF Image Greetings to Send Across on Chhatrapati Shivaji Maharaj’s 329th Birth Anniversary. A committee of experts appointed a few years ago by the then government, discovered that the date was February 19, 1630, and Falgun Vadya Tritiya as per the tithi. The experts said that important dates in history were considered based on the Gregorian calendar. However, irrespective of the dispute on the date of birth, the occasion to celebrate the birth anniversary of Chhatrapati Shivaji Maharaj is an auspicious and honourable act. Below are some facts on the Maratha Warrior who changed the course of history and remains an inspiration for all of India and the world. 1. The great Indian warrior king was born on April 6, in the 16th century, at Shivneri hill-fort, in (now) Pune. 2. Shivaji was greatly influenced by his mother, Jijabai, from his early childhood days. 3. Dadoji Konddeo was the man who is accredited for Shivaji’s education and training in his early days. 4. Shivaji was a religious person. He read both, ‘Ramayana’ and Mahabharata early in his childhood, which had a lasting impact on him. 5. Shivaji’s valour and strong-mindedness first came to light when he killed Adil Shah in 1657. He had worn his armour below his clothes and had hidden a dagger below his right hand. The rest they say is history! 6. Well, Shivaji was never anti-Mughals since the beginning. He had cordially maintained ‘limited’ relations with them till the year 1657. However, a double-cross by Mughals then, made him snap his ties with them and the confrontations with them began then. 7. Shivaji’s escape from Aurangzeb’s captivity, smuggling himself and his son in sweet boxes, is another tell-o-tale in his glorious history. 8. Shivaji’s coronation ceremony wasn’t an easy one either. There were controversies whether he was a Brahmin or a Kshatriya at the time of his coronation. However, after much ado and all controversies done and dusted, he was given the title of ‘Chhatrapati’ in the year 1974. The meaning of Chhatrapati is ‘paramount sovereign’. 9. Not many people know that Shivaji was also given the titles of ‘Shakakarta’ and ‘Haindava Dharmodhhaarak’ too along with the title of Chhatrapati. Shakakarta means ‘founder of an era’, whereas the latter meant ‘protector of the Hindu faith’. 10. Though the Persian language was the norm then, Shivaji profusely promoted both Marathi and Sanskrit languages during his reign. Shivaji Maharaj's history is too vast and has numerous important points from time to time. A leader that Marathas look up to even today, he was a true inspiration to not just the community, but even warrior kings of his time. Maharaj, as he is called by the people of Maharashtra, continues to rule the hearts of the people of Maharashtra as well as the nation, because of the qualities he represented and the values he stood for even in times of crisis.